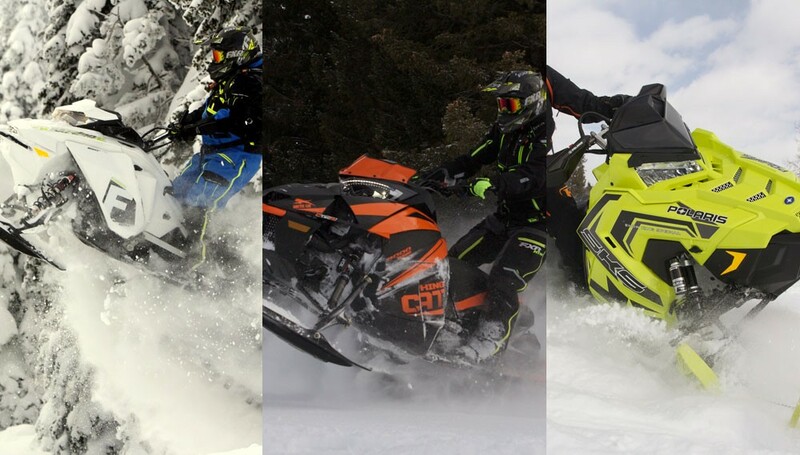 With the 2017-18 riding season fast approaching, we thought this would be a good time to tell you about Snowmobile.com’s 2018 mountain snowmobiles of the year. When mountain snowmobiles actually became “mountain snowmobiles,” cell phones were as big as a boombox and were dumb. Diesel pickups were smelly and underpowered. Lastly, folks actually spoke to each other, not text each other. Now that the snowmobile market is 18 model years into the 21st Century, what then are Snowmobile.com’s 2018 Mountain Snowmobiles of the Year? With this crown, what then are the top podium holders for Snowmobile.com’s other respective mountain categories: ultra-deep powder, most improved, four stroke, deep-powder crossover and introductory? Crushing a homerun off the first pitch is the 2018 Mountain Cat from Arctic Cat. For several years, Arctic Cat’s M8000 Sno Pro, M8000 Limited or last year’s Mountain Cat has been Snowmobile.com’s “Mountain Snowmobile-of-the-Year Honorable Mention” or “Most Improved Mountain Snowmobile,” and quite frankly, we’ve grown accustomed to Cat being the bridesmaid behind Ski-Doo or Polaris. But now for this model year, we give a Rocky Mountain cowboy “Yee haw” to Arctic Cat for giving the mountain rider its 2018 Mountain Cat 153 and 162; it has arrived to take its place at the head of the line. The 153 or 162 Mountain Cat with its new tightened and cinched-in Ascender chassis, its smoothed-out and cleaned-up Next-Gen body cladding, opened up toe wells, dropped and rolled chaincase, new Arctic Cat-influenced Team clutches, lock-out rear suspension via a Fox Float 3 QSL shock (QSL for Quick Switch Lockout), a 15-pound weight dump, and a new Arctic Cat -designed and -built two stroke twin; the Mountain Cat makes no apologies when it shreds. Here is our full write-up on the 2018 Mountain Cat. But, there is more to this Mountain Snowmobile of the Year category. We wrestled with this decision until we were tired and sore. Coming in a smidgeon behind the Mountain Cat was the Gen4 REV 850 Freeride 165 from Ski-Doo. This latest Gen4 deep-powder missile is a delight to ride. With its 850 power, narrow Gen4 REV chassis and all things Gen4 Summit X-like, this Freeride is not the Freeride we know from XM chassis of past years. The 2018 Freeride 165 has sweetness, but there is a little gadget that makes a Freeride sweeter still, and that is SHOT – Start Hot. We’ve devoted pics and text to this happy button and come to declare, the SHOT button is a healthy shot to the mountain snowmobile economy. Backcountry freestyle artists, riders, hucksters and powder hounds will appreciate the Freeride’s shock package – its versatility – and its ride and handling. In our opinion, the Freeride is to the Summit X, what the Summit X is to the Summit SP, and each is simply great. After breaking some deep pow pow in British Columbia, January 2017, the best powder wrecking machine we found at that time and again confirmed at PhotoShoot 2018, was Ski-Doo’s Gen4 Summit X 175. What can we say? We give a one-word answer, respect. What’s not to like and grovel at when a Gen4 850 Summit X, with Ski-Doo’s standard 16-inch wide Powder Max Lite track with three-inch paddles, is stretched to 175 inches? What’s not to adore when a 175 acts like a 165 Summit X? This is the crème da la crème of ultra-long deep-powder muscle. Ski-Doo keeps racking up the wins with its Gen4 REV chassis and the 175 Summit X is nimble and fast, light and powerful, and the embodiment of all things deep powder. For those Spring-buy purchases, the 175 Summit X could have been optioned-out with SHOT; long and sweet indeed. Is it not true with human behavior, we often return to the tried-and-true? That which we know? It’s like trying other pepper hot sauces only to return to that good old favorite: Tabasco (or one of your choosing). For us, the most improved mountain snowmobile, and it falls again on an Arctic Cat, is the trusty in-season M8000 Sno Pro 153 and 162. Why not the M8000 Limited? Well, one answer: the Sno Pro is that good ol’ favorite. Cat claims another win here with its King Cat. We piloted a King Cat through most of season 2017 and with it came fond memories of “Killing it.” Fond? Really? The King Cat with its high-horsepower turbocharged motor – with over 200 horsepower – is all about being bad-to-the-bone (or to the powder). The King Cat comes assembled on Cat’s Ascender chassis with Next-Gen panels. But the itty bitty hole that holds the motor was expanded by Arctic Cat (and Yamaha) to hold the big Yamaha motor with turbocharger. As a 162 only and with a tall PowerClaw track with three-inch paddles, the King Cat packs its skis up the steepest of steeps. Our fleet of guest-test riders learned throughout season 2017, that when gravity begins to tame the King, two or three quick throttle braaps allows the King Cat to extend its claws and climb steeper still. Easy pick here, the new 2018 SKS 146 from Polaris. As we all know, Polaris does steep-n-deep very well. We’ve also learned from many product launches, that Polaris builds some fabulous trail snowmobiles. Mix Polaris’ mountain and trail savvy and you have the SKS 146. Though we opened up this segment by writing, “Easy pick here….” For us on the Mountain Team, this was actually a tough choice. We certainly like Ski-Doo’s Gen4 Freeride 146 and Summit SP 146, but after debating and arguing during the hot summer months, we settled on the SKS 146. So, the 146 SKS with its AXYS chassis and peppy 800 twin motor, Polaris targeted this crossover to the rider who has deep-powder wants. With its new Polaris Peak track, a Series 5 2.6-inch paddle track where its paddles are molded to a shorter 2.25 inches, the SKS with its wide hybrid PowderTrac runningboards, uncoupled IGX rear suspension and Gripper skis, is a Snow Check Select crossover that is fairly adept to bonking some powder and straightening the curves. Oh, and it is good looking. This goes to the baby 8 Pro-RMK 600 155. The 600 Pro-RMK is built with all the same wizardry the in-season Pro-RMK 800 has, such as the narrow and lifted AXYS RMK chassis, PowderTrac runningboards, Pro-Lite seat, and that wonderful low-inertia QuickDrive belt drive system. Oh blessed be. The in-season Pro-RMK models are not new mountain snowmobiles from Polaris for model year 2018. The 600 Pro-RMK is a nimble wondersled that is light like its 800 Pro-RMK brother at about 407 to 413 pounds, depending on options. This little Pro spins the Series 5.1 paddle track that sports 2.4-inch paddles and is 155 inches long. We believe the 600 Pro-RMK can handle the Series 6 track with 2.6-inch paddles, but that is just us. For last thoughts, the 600 Pro-RMK 155 is perfect for the learner, the teenage son or daughter who is Dad’s pal on the mountains, for the rider who is bold enough to ride a six-oh-oh like it’s an 800, or for the youngest of baby boomers who has just figured out, it is time to slow down. Let’s say it again, and again – S-H-O-T. SHOT, Start Hot. Ski-Doo has passion and it showed last season with its Gen4 REV chassis and 850 power. Then Ski-Doo made its mountain line more attractive, more credible, and more customer friendly by giving its mountain line the optional electronic starting system that has no starter motor and no heavy battery. SHOT features a large rapid discharge capacitor, called Ultra Capacitor, which from a press of a button dumps a stored charge to the motor’s magneto, turning it into an electric starting motor. With the charge, the electrified magneto spins the 850 E-TEC motor’s crankshaft, one-third of its rotation, which is enough to bring motor to life. This is not “electric” start as we know it where a battery forces a starter motor to engage a ring gear which spins the crankshaft to coax a motor to life. When engaged the SHOT button wakes up the sled’s electronic control module, which directs a charge to the magneto, while supplying a precisely timed, directly injected fuel charge to feed the engine. This capacitor discharge unit is batteryless – no starter motor and no ring gear. Total weight is two pounds of hanging weight and no rotating mass.